Since 2013, the Central African Republic (CAR) has been marked by a violent conflict that has resulted in thousands of deaths and the displacement of hundreds of thousands of people. 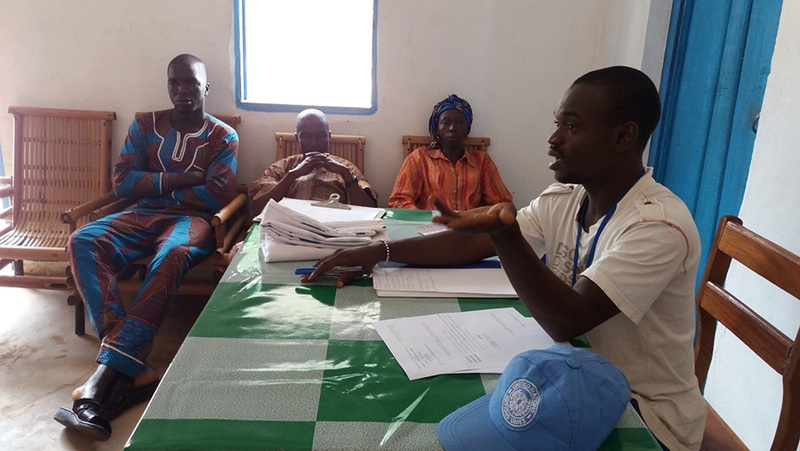 The United Nations Volunteers (UNV) programme, in support of peacebuilding initiatives, deployed 250 UN Volunteers throughout the Central African Republic. 15 are involved in the ARAT project, which contributes to the reconstruction and restoration of the rule of law. Ludovic Brandhot is a national UN Volunteer serving with the local government in Mbrès, Central African Republic. For more than four years, instability persists in the country. Approximately 60% of the territory remains occupied by armed groups. In the prefecture of Nana-Grébizi, in the heart of the country, clashes between rebel groups in 2016 and March 2017 completely paralyzed the activities in the city. The civilian population was trapped. Today, te humanitarian situation continues to be unbearable. Basic social services are not assured, there are not enough health workers left to care for the population, and access to safe drinking water is no longer guaranteed. Mbrès was once known as an eminent agricultural area. With the end of commercial transportation, products now perish before they can reach markets. Sources of income have diminished considerably. Without economic stability, it is difficult to build lasting peace—another disastrous consequence of the events of recent years in Mbrès, and the ongoing threat to personal security and the crumbling economy. One of his roles is to promote cooperation by bringing Muslim and Christian communities together to work on common goals. The objective for the 25,500 inhabitants of the sub-prefecture is to live together and build a future for all. As a UN Volunteer associated with the local government in Mbrès, one of my main activities consists of conveying the message of social cohesion and contributing to the acceleration of the socio-economic recovery of the communities. I encourage young people not to stand idly by, in order to avoid being recruited by armed groups. "With the UNDP project to Support Livelihood Stabilization, which aims to accelerate the socio-economic recovery of communities, and despite security constraints, I have already worked with 44 economic interest groups who have presented their activities,” affirms Ludovic. “The 16 best among them will be selected to serve as an example for the rest. It is like the seed that falls on fertile ground and bears good fruit." Before the crisis, participants received pay for trade apprenticeships. The project, which advocates teamwork, benefited many people, assisting them in learning or sharing with peers through organized meetings. The members of each group say they have benefited from ideas, profession, and direction. These groups are engaging people at the very heart of the community. For example, Charles Edmond Yaote of the "Youth Group", who has experience in masonry, has agreed to share his experience with all the young people who join his group in Mbrès. In the "Life Source Group ", Yves Josué Gremende, a dress designer, currently trains three young people from his group in this trade. In this way, Edmond and Josué help to restore hope and turn lives around. These initiatives give youth in the Central African Republic the opportunity to be the architects of peace. This is the best hope for the future of the country.